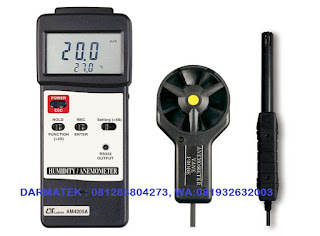 We as Lutron AM-4205A Vane Type, Hot Wire Type Humidity/ Anemometer + Type K/ J sales center serve free shipping for Jakarta and surrounding areas, please contact our sales on mobile: +62812 8380 4273, wa : +62819 3263 2003.
air flow measurement: m/s, km/h, ft/min, knots. mile/h. 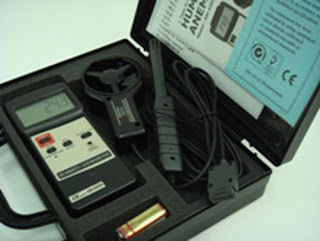 Low-friction ball vane wheels is accurate in both high & low velocities for anemometer. Thermistor sensor for Temp. measurement, fast responsetime. Darmatek is The Lutron AM-4205A Sales Online Shop, survey tool. We are here as a supplier of land or building survey equipment, telecommunications survey tools, geological surveying or mining tools, and other survey tools including Total Station, Digital Theodolite, Automatic Level, GPS, Compass, Binoculars, Monocullars, Laser Rangefinders, Night Scope, Digital Altimeter , Clinometer, Tandem, Digital Planimeter, Distometer Speed ​​Gun, Measuring Wheel, Measuring Tape, Grounding Tester, Handy Talky HT, Sound Level Meter, and Geological tools, PH Meters, Lux Meters, Anemometers, Thermohygrometers, Thermometers, Sirens, etc. Supported by brands that are well known and recognized in the survey world, including Topcon, Nikon, Sokkia, Garmin, Trimble, Magellan, Suunto, Horizon, Bushnell, Brunton, Leica, Bosch, South, Yamayo, Tajima, Icom, Kyoritsu, Lutron, YAHAGI, Lion King, AZ, Hach, Sanfix, DEKKO, etc. Hopefully our existence can answer while meeting the needs of survey tools whose existence is needed in the era of development and technology development at this time. For those outside the city, we receive payment in advance, we will send the items via Tiki, JNE express (depending on the destination city) or use other expeditions, or you who have friends, residents or branches in Jakarta as your representative in Jakarta. your representative in Jakarta. Surabaya, Bali, Sidoarjo, Malang, Semarang, Yogyakarta, Pekalongan, Cirebon, Tangerang, Jakarta, Bandung, Sumatra, Aceh, Lampung, Medan, Riau, Batam, Jambi, Padang, Kalimantan, Samarinda, Pekanbaru, Bengkulu, Makassar, Sulawesi, Irian Jaya, Papua, Bangka Belitung, Banten, West Java, Central Java, East Java, NTT, NTB, Gorontalo.